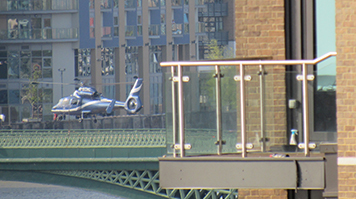 The London Heliport Consultative Group has engaged London South Bank University's (LSBU) acoustic experts to monitor and measure the impact of noise levels from Battersea Heliport. In part this is done by assessing the noise from within people’s homes, however academics are now also asking residents in Wandsworth, Hammersmith and Fulham, and Kensington and Chelsea to contribute to the study by completing an online survey. London’s only commercial heliport is largely used by sightseeing tours and the business community, and currently permits 12,000 flights annually. A report will be produced by LSBU's team in autumn to be presented to the three boroughs, the Greater London Authority and Civil Aviation Authority, assessing the results in relation to relevant policies. Dr Stephen Dance, a reader in Acoustics at LSBU’s School of Built Environment and Architecture, said: “The heliport at Battersea was built in 1959, when the urban landscape was dramatically different. Dr Luis Gomez-Agustina, lecturer and researcher at the LSBU Acoustics Group, added: “This is the first time since the heliport started operations that a complete objective and subjective study on the noise emissions and their impact is going to be undertaken.